5: Aerotolerant organisms do not require oxygen and cannot utilise it even if present; they metabolise energy anaerobically. Unlike obligate anaerobes, however, they are not poisoned by oxygen. 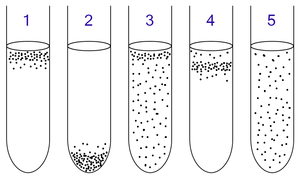 They can be found evenly spread throughout the test tube. Both facultative anaerobes and aerotolerant organisms will undergo fermentation in the absence of oxygen, but the facultative anaerobes will switch to aerobic metabolism when oxygen is present (a phenomenon known as the Pasteur effect). The Pasteur effect is sometimes used to distinguish between facultative anaerobes and aerotolerant organisms, in the lab. Obligate anaerobes are microorganisms killed by normal atmospheric concentrations of oxygen (20.95% O2). Oxygen tolerance varies between species, some capable of surviving in up to 8% oxygen, others losing viability unless the oxygen concentration is less than 0.5%. An important distinction needs to be made here between the obligate anaerobes and the microaerophiles. Microaerophiles, like the obligate anaerobes, are damaged by normal atmospheric concentrations of oxygen. However, microaerophiles metabolise energy aerobically, and obligate anaerobes metabolise energy anaerobically. Microaerophiles therefore require oxygen (typically 2–10% O2) for growth. Obligate anaerobes do not. Dissolved oxygen increases the redox potential of a solution, and high redox potential inhibits the growth of some obligate anaerobes. For example, methanogens grow at a redox potential lower than -0.3 V.
Sulfide is an essential component of some enzymes, and molecular oxygen oxidizes this to form disulfide, thus inactivating certain enzymes (e.g. nitrogenase). Organisms may not be able to grow with these essential enzymes deactivated. Growth may be inhibited due to a lack of reducing equivalents for biosynthesis, because electrons are exhausted in reducing oxygen. Obligate anaerobes metabolise energy by anaerobic respiration or fermentation. In aerobic respiration, the pyruvate generated from glycolysis is converted to acetyl-CoA. This is then broken down via the TCA cycle and electron transport chain. Anaerobic respiration differs from aerobic respiration in that it uses an electron acceptor other than oxygen in the electron transport chain. Examples of alternative electron acceptors include sulfate, nitrate, iron, manganese, mercury, and carbon monoxide. Fermentation differs from anaerobic respiration in that the pyruvate generated from glycolysis is broken down without the involvement of an electron transport chain (i.e. there is no oxidative phosphorylation). Numerous fermentation pathways exist e.g. lactic acid fermentation, mixed acid fermentation, 2-3 butanediol fermentation. The energy yield of anaerobic respiration and fermentation (i.e. the number of ATP molecules generated) is less than in aerobic respiration. This is why facultative anaerobes, which can metabolise energy both aerobically and anaerobically, preferentially metabolise energy aerobically. This is observable when facultative anaerobes are cultured in thioglycollate broth. Examples of obligately anaerobic bacterial genera include Actinomyces, Bacteroides, Clostridium, Fusobacterium, Peptostreptococcus, Porphyromonas, Prevotella, Propionibacterium, and Veillonella. Clostridium species are endospore-forming bacteria, and can survive in atmospheric concentrations of oxygen in this dormant form. The remaining bacteria listed do not form endospores. Examples of obligately anaerobic fungal genera include the rumen fungi Neocallimastix, Piromonas, and Sphaeromonas. ^ a b c d e f Prescott LM, Harley JP, Klein DA (1996). Microbiology (3rd ed.). Wm. C. Brown Publishers. pp. 130–131. ISBN 0-697-29390-4. ^ a b c Brooks GF, Carroll KC, Butel JS, Morse SA (2007). Jawetz, Melnick & Adelberg's Medical Microbiology (24th ed.). McGraw Hill. pp. 307–312. ISBN 0-07-128735-3. ^ a b c d e Ryan KJ; Ray CG, eds. (2004). Sherris Medical Microbiology (4th ed.). McGraw Hill. pp. 309–326, 378–384. ISBN 0-8385-8529-9. ^ a b c d Hogg, S. (2005). Essential Microbiology (1st ed.). Wiley. pp. 99–100, 118–148. ISBN 0-471-49754-1. ^ a b c d Levinson, W. (2010). Review of Medical Microbiology and Immunology (11th ed.). McGraw-Hill. pp. 91–178. ISBN 978-0-07-174268-9. ^ a b c d Kim BH, Gadd GM (2008). Bacterial Physiology and Metabolism. ^ Carlile MJ, Watkinson SC (1994). The Fungi. Academic Press. pp. 33–34. ISBN 0-12-159960-4. This page was last edited on 10 November 2017, at 15:32 (UTC).